Last Call 19-080: 4/20/2019. Mt Zion Special Operations responded for tree down on Rt 92. New video from 2018, highlighting so many of the trainings that our fire company hosted and our members participated. Perhaps you would consider being one of us. We are always open to new members. Just stop by the firehouse and fill out an application. Even if you don't want to fight fire but would like to help out with our fundraising, we do accept social members for such occasions. Every little bit helps. Today, Mt Zion Fire hosted Rope Rescue 3 with Instructor Matt MacDonald. The training was held at the Mt Zion Firehouse and an area of Exeter Township known as "Heaven's Ledge" or "Morning Star." The first day of this two-day training (16 hours) involved a short review of Rope Rescue 2 as well as tying a rescuer and a Stoke's basket to be lowered down a cliff and then raised up the cliff. More practice of descending and ascending will be held Sunday. Pictured below is an uncompleted Mt Zion Firehouse and our first two pieces of used apparatus, a 1956 Ford engine and a 1963 GMC 1500 gallon tanker. The engine was replaced in the 1980s with a 1967 Hahn. The tanker remained in service at Mt Zion, after a 2000 gallon tank upgrade, until around 2000, when it was replaced with a 1988 Volvo White GMC 3000 gallon tanker. Fire units from Mt Zion Fire and Harding Fire responded along with the Harding Mt Zion Ambulance to an 1/2 acre field fire off Perry Road. 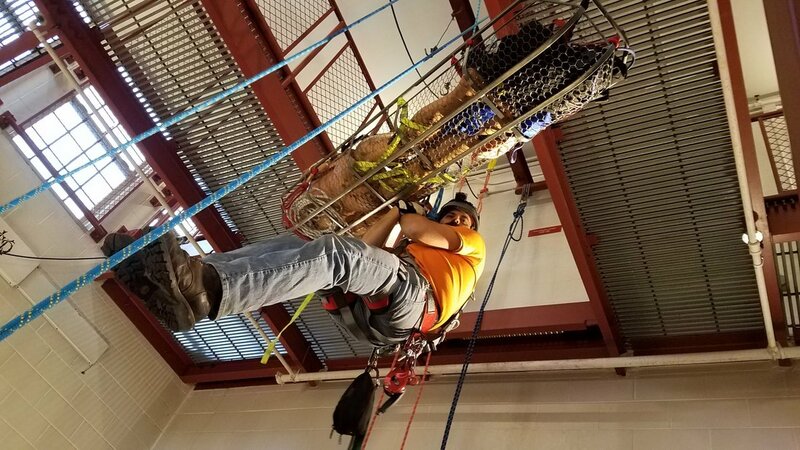 Firefighters and EMS personnel from Mt Zion, Edwardsville, Franklin Township, Trucksville, and West Wyoming trained for 32 hours to prepare for Rope Rescue Certification. Instructors Matt MacDonald, Carl Mehne, and Mike VanLuvender helping us to learn and practice. A big Thank You goes out to the Kingston Fire Department and Chief Frank Guido for allowing us to learn at their facility. During the month of November, Mt Zion Bicentennial Fire hosted Basic Vehicle Rescue Operations with Bucks County Community College Instructors Matt MacDonald and Carl Mehne. Firefighters from Mt Zion, Dennison Township, Exeter Borough, Hanover Township, Franklin Township, Kingston Borough, Trucksville, West Pittston, and West Wyoming, learned and used everything from basic hand tools up to hydraulic tools (aka "Jaws of Life"). Special thanks to Ed Spencer Auto for allowing us to practice skills. On Sunday, November 4, 2018, Mt Zion Chief, Robert Kile Jr, First Assistant Chief, Gary Eble, Second Assistant Chief, Robert Kile Sr, Captain, John Tillman, Firefighter Josh Hilstolsky, along with Exeter Firefighter, Justin Parr, successfully completed 14 skill stations at the Pike County Burn Complex. Good work, guys! Over 32 hours, several Mt Zion firefighters along with firefighters from Franklin Township, Exeter Borough, and West Wyoming are training at the Mt Zion Firehouse in preparation to take their Firefighter I skills and written tests. This involves hose line advancement, knot tying, fire extinguisher use, ladder placement and utilization, standpipe operations, air pack training and safety, fire streams, search and rescue in a fire and so many other areas. Twenty-four hours of training, eight indoors and 16 outside, culminated on Sunday, July 15 with scenarios. Instructors Matt MacDonald and Carl Mehne were at it again. Sunday, June 3, 2018, Day 2 of Rope Rescue 2. Once again, emergency personnel from Franklin Fire, Mt Zion Fire, Pittston Regional EMS, and West Wyoming Fire trained with Matt MacDonald and Carl Mehne. More photos are on the "Picture/Training" page. Saturday and Sunday, June 2 and 3, Mt Zion Fire along with Franklin Fire hosted Rope 2, a rope rescue training. Emergency personnel from Franklin Fire, Mt Zion Fire, Pittston Regional EMS, and West Wyoming Fire trained with Matt MacDonald and Carl Mehne on climbing and repelling, picking off stranded climbers, and rescuing injured. More photos are located on the "Picture/Training" page. The Mt. 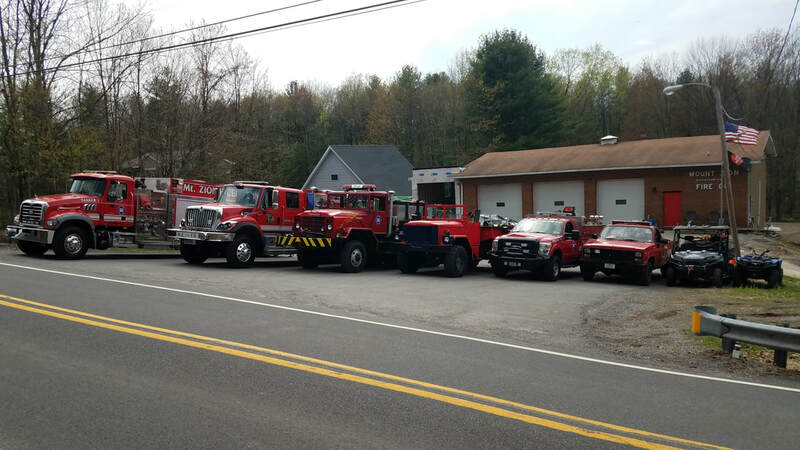 Zion Bicentennial Volunteer Fire Company of Luzerne County, Pennsylvania, is a department full of devoted men and women willing to sacrifice their all to protect the citizens of Exeter Township and surrounding communities. We provide protection related to fire emergencies, vehicle and other rescues, and assist in emergency medical calls. Our members like to have fun, but we are very serious about our job. We train to keep up our skills to provide UNCONDITIONAL SERVICE to the best of our abilities.